Vail / Beaver Creek zip line tours in the area are what an adventure is all about. Zip lining is safe for the whole family and taking a zip line tour is an activity that is new and exciting. When you are in the area of Breckenridge zip lining is a great activity when vacationing in the Colorado High Country it gives you access to all types of fun activities. Zip lining requires no experience just the need to have fun. Vail / Beaver Creek zip lining in the area can take you up to speeds of 55 miles per hour or go as slow as you want, you are in control. Outfitters in the area that provide Vail / Beaver Creek zip line tours have locations that provide beautiful views of cliff sides, rock outcroppings, 14,000 foot peaks and dense forests. You can go side by side or race, you can even go hands free if you want. 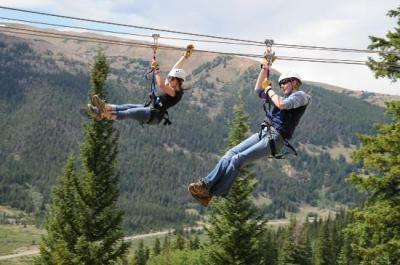 Vail / Beaver Creek zip lining in the area is a great activity for a family vacation, group vacation or corporate event. Since zip lining is a very popular activity, plan in advance. Don’t worry about the time of year you can even go zip lining in the winter.